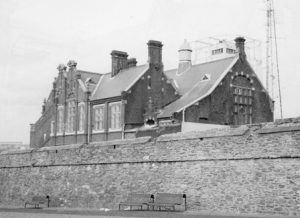 One of the more imaginative new uses of a buildings at risk has been the scheme for the First Derry Primary School that appeared in the first BaR catalogue. Built in 1894 the building is Grade B1 listed within the Walled City Conservation Area. The building was restored in 2000 by architects Hall Black Douglas as an education & arts facility and is now known as the Verbal Arts Centre (who now own and manage the building). 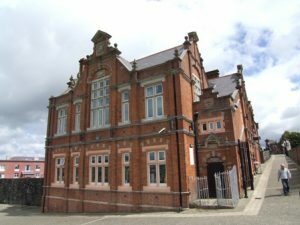 Works included the restoration of the exterior & formal first floor spaces; substantial remodelling of the enclosed playground area to form a new reception area and an extension. The new centre provides performance and exhibition areas; a debating chamber; a library; an archive and a writer’s residence. NIEA Listed Building Grant Aid; Arts Lottery Fund; Derry Development Office; Derry City Council; The URBAN Programme; International Funds for Ireland (IFI); Northern Ireland Tourist Board (NITB) and ADAPT.